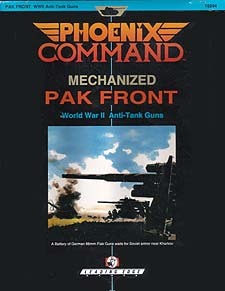 This supplement to the Phoenix Command Mechanized Combat System provides the Weapon Data for the primary Anti-Tank Guns of World War II. Included are the 24 most prominent Anti-Tank Guns of the war, from the German 37mm Pak 36 to the devastating 88mm Pak 43, and from the British 2 Pounder to the US M5 3 Inch Gun and the Soviet 100mm D-10. Full descriptions of each Gun are also given as are the special rules for using World War II Anti-Tanks Guns.